PGIMER 2019: Postgraduate Institute of Medical Education & Research (PGIMER), Chandigarh Conducts the PGIMER Exam two times in a Year, i.e. January and July. Through PGIMER University offers admission into MD/ MS & DM/ M.Ch/ MHA Courses. The Admission will be based on the All India Merit list. Update 6th October: PGIMER 2019 January Session MD/MS Application Form Available now!! Fill it before 2nd November 2018. Update. : PGIMER 2019 January Session MD/MS Dates Announced !! 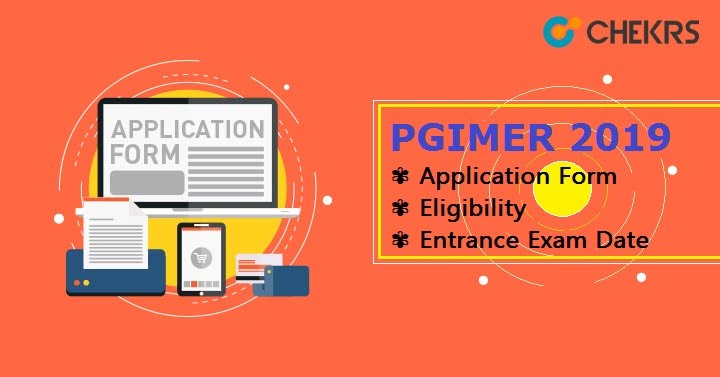 In this article, we are explaining all the important events of PGIMER 2019 such as PGIMER Application Form, Eligibility, Entrance Exam Dates, Results, and Counselling process. PGIMER Chandigarh Conducts the PGIMER Exam two times in a Year, i.e. January and July. We are providing here tentative PGIMER Entrance Exam Dates for both. The schedule is based on previous year exam dates. Here we are providing eligibility criteria for filling the application form, Candidates have to fulfill all the PGIMER Eligibility Criteria to appear in the exam. All the Interested candidates must be a registered person with Central /State Medical Registration Council. Candidates who are interested in MD/MS courses, they must hold the MBBS or equivalent Degree, recognized by Medical Council of India. All the Candidates must complete or due to complete one-year rotatory internship training on or before 31st December 2018 for PGIMER January 2019 Admission Session and 30th June 2019 for July session. Candidates who are interested in DM/M.Ch courses, they must pass MD/MS or its equivalent examination, recognized by Medical Council of India. All the Candidates must complete the given age on or before 31st December 2018 for January session and 30th June 2019 for July session. The Application form will be available only on the website, Candidate has to visit the official website to fill the PGIMER Application Form. The tentative dates for the application availability are given in the above table. For January 2019 session the form will be available in the month of October 2018, and for PGIMER July 2019 Admission session application will be available in the month of March/April 2019. All the Candidates have to pay the application fee through the Offline/challan mode. The Challan should be filled in the name of Director, PGIMER, Chandigarh (Examination) in the Power Jyoti Account No. 32211613319. There will be some additional Bank charges. The PGIMER Application Fee for General category: Rs. 1000/-. Application fee for For SC/ST category: Rs. 800/-. We are also providing Exam Pattern for PGIMER 2019, Candidate can prepare for the exam using the provided PGIMER Exam Pattern and Syllabus. Exam Mode and Part Offline mode. Offline mode (Part 1: General & Part 2: Specialty), each with 40 marks. Exam Duration: 3 hours. 1 hour 30 minutes. Here we are providing the syllabus for PGIMER MD/ MS Courses for more details check the official website. Solve Previous Year’s PGIMER Papers. PGIMER Admit Card will be distributed through the online mode only. The candidate has to login to the official website and go through the on-screen options to access the PGIMER Hall Ticket. PGIMER Admit Card will be required at the examination center. So keep it safe. It will be also required at the time of Document verification. The Result will be also declared on the official website Candidate have to visit to the official website to access the Result. They have to visit the official website and enter the roll number to check their PGIMER Result. The University will also prepare and declare an overall PGIMER Merit List on the basis of percentile scores obtained by the candidates in the theory examination. The university will also release separate lists of qualified students for rank and category for PGIMER 2019 Counselling. Qualified candidates or candidates whose name are listed on the rank/merit list will be allowed for counseling. Counselling will be conducted through offline mode. For PGIMER Admission, candidates have to bring all below-listed documents for verification. After successful document verification, qualified candidates will get PGIMER Admission in preferred courses.